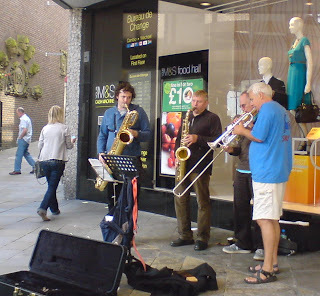 Strolling down Northumberland Street in Newcastle I was delighted to hear swingy sounds filling the air. Even without a rhythm section, apart from the baritone sax who played some bassish lines, it swung along nicely. Radio 2 should have been recording it! (That's a compliment by the way guys - see previous post). I didn't realise it at the time but the four hornmen are an offshoot of Soznak - a band that was one of the success stories of the recent Mouth of the Tyne Festival. I should have stayed longer! I must also commend them on their business acumen - set up next to a cash machine. No excuse folks! If you want to know more go to their excellent myspace site. Further down the street some religious sect were singing and preaching the Gospel whilst in the Central Arcade, outside of J.G.Windows, two young violinists were displaying their undoubted virtuosity. From my days of working in the Arcade I know just how wonderful the acoustics are. Finally, as I descended via escalator to the bowels of Monument Metro Station I heard the plaintive wail of an alto sax. It was a sound I'd recognise anywhere - Diane from Dinnington. Think "Harlem Nocturne" and you've got Diane. No one can make an alto sound quite as melancholy as Diane - apart from Johnny Hodges that is. I'd never seen her for years and it was nice to chat and catch up. All in all there was some good music out there today. PS: Fun link added by Paul. Tonight at the Chilli - MONK LIVES! YORK JAZZ SCENE ISSUE 3 LAUNCH! One Not To Miss - says John Taylor. Ron Chapman - Sand Dancer, South Shields. Horn Dogs @ Bridge Hotel. 20th August. Tyne Valley Stomping in Saltwell Park. Tessa Smith - check her out. Newport R.I. 2009 on npr. Hey Jude - Come Back Soon - Likewise Alan Davis. Prom 22: MGM Musicals at the Albert Hall.